Ray Crowley sent these snapshots from the Chestertown (MD) Tea Party, taken at the Washington College Pavilion or underway on the Chester River. The event was held this May. 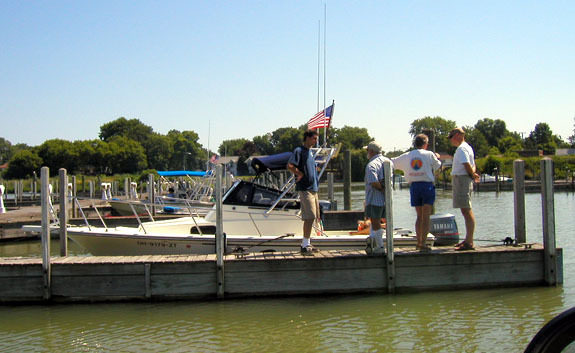 The Rendezvous participants gather at the dock at Washington College Pavilion on the Chester River, Maryland. Don't worry, the edge of the dock is fendered and won't scrape the gelcoat on these fine boats! That's Bob Gaban (B Bear) making fast his 16-DAUNTLESS. From this reverse view we get a better look at the boats. Looks like a 21-Outrage, 16-Dauntless, Montauk, Montuak, Montauk, 17-Dauntless --hey who let that Carolina Skiff in? Don McIntyre organized a fine gathering in Port Huron (MI) coincident with the famous race weekend of the Bayview Bacardi Port Huron Mackinaw Race this July. For many participants it was a three-day event, beginning Friday evening with about 75,000 other racers, fans, and general well-wishers. If you've ever been to one of these pre-Race parties, you wonder how the crews can stand up to go sailing the next day. 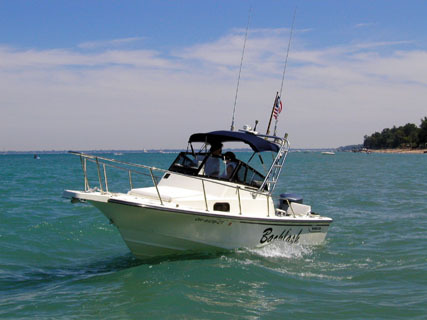 The weather was perfect on Saturday, and we followed the big yachts out into Lake Huron for the race start. Attendees and their boats included Jim Gibson (19-Outrage), Jim Hebert (20-Revenge), Don and Gail McIntyre (21-Outrage), Gary Malone and his family (21-Outrage), Jeff and Rosie Angeleri (21-Walk Around), Steve and Caroline Farnsworth (21-Walk Around), and John and Katie Flook (22-Outrage). In addition, we sighted about a dozen other Boston Whalers just out for a day on the water themselves. On Saturday evening we had a great catered meal from a local restaurant, enjoyed picnic style under the shade of the marina pavilion--an excellent idea that eliminated everyone having to try to cook after a long day of boating. Everyone trailered their Whaler to the nice (free) launch ramp on the Black River in downtown Port Huron. It's just a mile off the interstate and close to the St. Clair River. Jeff Angeleri, John Flook, Steve Farnsworth, and Don McIntyre take a close look dockside at BACKLASH. 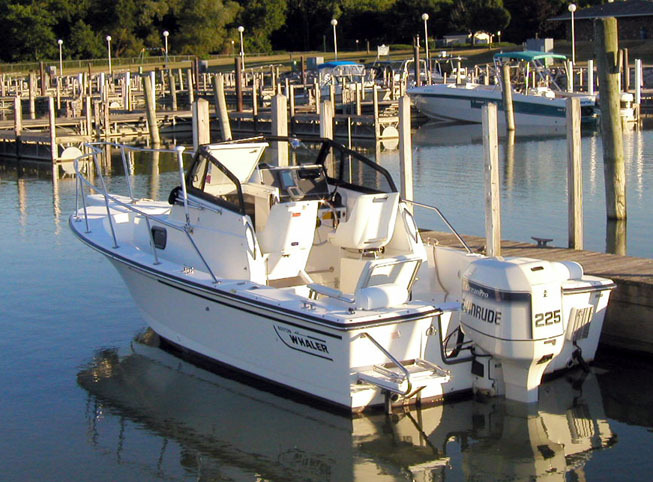 With 225-HP on the transom, this 21-Walk Around is aptly named. 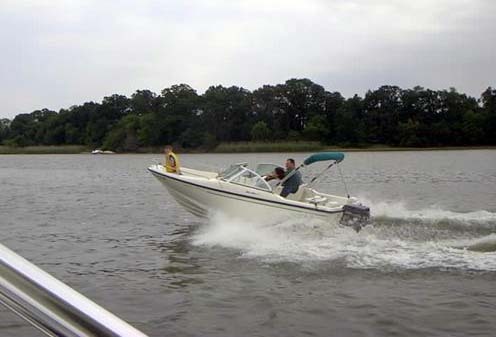 The twin cushioned rear quarter seat cushions are adaptations from another Whaler hull using Whaler parts. 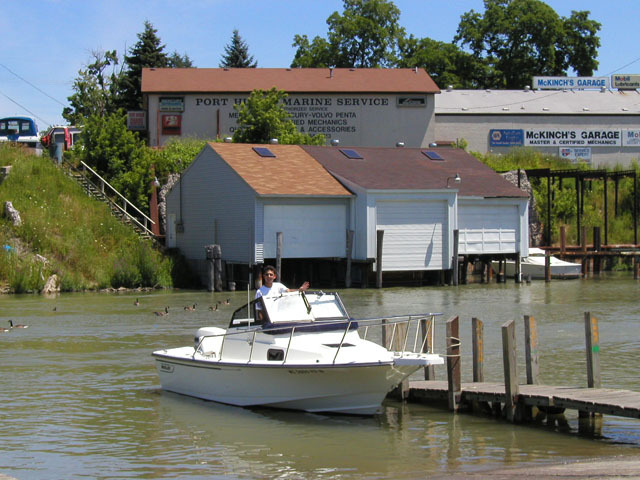 The City of Port Huron opened their municipal marina for the weekend. 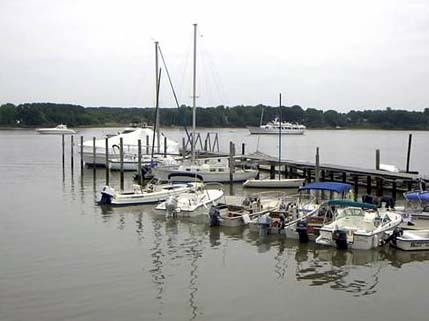 It had been closed otherwise due to some shoaling and general excess marina capacity in the area. To get out to the lake we had to motor down the Black River about a mile, then turn north in the St. Clair River and pass under the Blue Water Bridge. 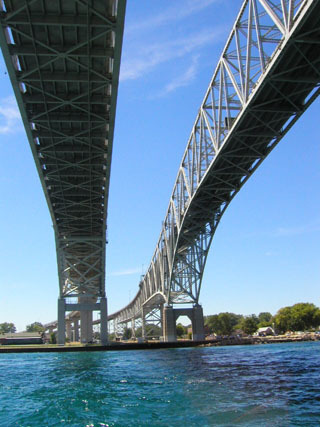 The twin spans connect Port Huron to Sarnia, Ontario. With the advent of NAFTA, commercial traffic grew so much the second bridge was a necessity after the first span had served alone for more than 50 years. Beneath them the entire volume of water of Lakes Huron, Michigan, and Superior drains into the St. Clair River--eventually flowing over Niagara Falls farther downstream. The current boils into turbulent rapids and eddies. USCGC MACKINAW marks the end of the starting line for the racers. 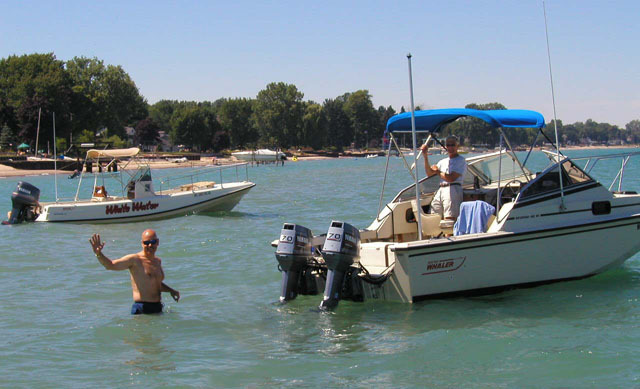 The race start takes place about five miles offshore in Lake Huron. Jim Gibson was kind enough to leave his beautiful 19-Outrage at the dock on Saturday and join me for the ride out to the lake aboard my 20-Revenge. After the racers were off, we cruised over to a sand bar on the shoreline to anchor and swim in the delightfully warm Lake Huron water. Have I mentioned how beautiful and blue the water of Lake Huron is? See for yourself. Water temperature was in the mid-70's. 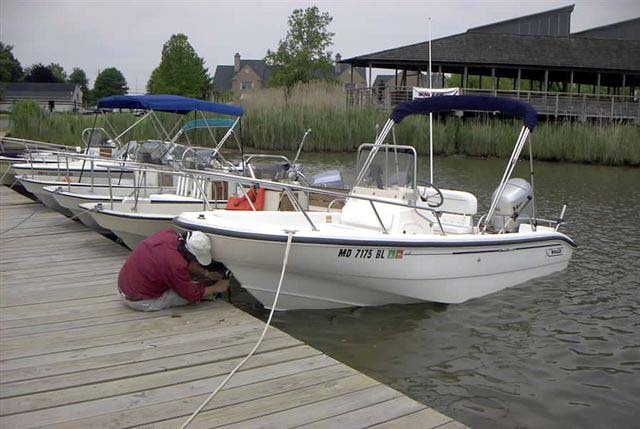 Don McIntyre comes over for a closer look at the twin engines mounted on 10-inch setback brackets on the transom of my 20-Revenge. 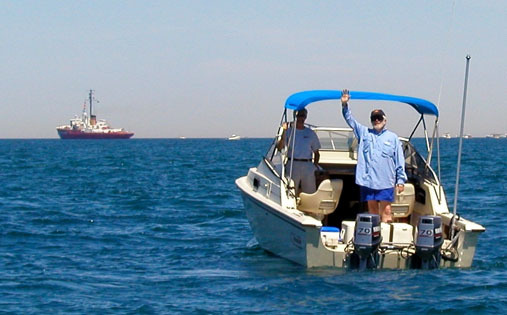 In the background his 21-Outrage sports a 200-HP Yamaha mounted on a jackplate. Also in the background is another 13-Sport and on the beach a Whaler 20-Super Cat. This delightful sand bar made a great place to anchor and cool off after watching the yacht race starts for a couple of hours. Jim Gibson, without a bathing suit, was stuck aboard while the rest of the gang went for a swim. The page has been accessed 40086 times. This article first appeared August 7, 2002.